Michael Griffith was born March 28, 1990 in Stratford, New Jersey. He relocated to Euless, Texas in 2005, where he graduated from Euless Trinity High School in 2009. Wanting to follow in his grandfather’s footsteps, Michael enlisted in the United States Army as a combat medic. There, he was put through a six week emergency medical technician class and earned national certification as an EMT. Shortly after his arrival to his duty station at Fort Bliss, Texas, Michael was involved in a hiking accident where he fell over forty feet, breaking his back, elbows, wrists and left ankle. After a year and a half of physical therapy, perseverance, and determination, he was unable to meet the requirements to be released for active duty and was ultimately medically discharged. 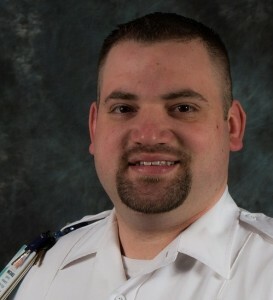 Unsure what he wanted to do with the rest of his life, Michael followed his high school sweetheart to Kilgore, Texas and secured employment with East Texas Medical Center EMS in 2013. In 2014, Michael was privileged to enroll in the ETMC EMS Paramedic program. After 11 months of intense training and clinicals, all while employed full time, he earned national and state certification as a Paramedic in February of 2015. Michael Griffith strives to be the standard bearer for EMS. He gives 100 percent in all aspects of life and his chosen career. One of Michael’s strongest virtues is his desire to improve. Although he places in our strongest group of Paramedics with regard to clinical ability, it is his consistent, intentional efforts to improve that separate him from others. Michael is a very compassionate person who was drawn to this field due to his caring nature. He always thinks of others first whether it is the patient, the patient’s family members, or first responders on the scene. Michael is willing to share his knowledge with student riders and first responders, and is able to do so in a manner that never comes across in an arrogant or negative fashion. His dedication to his profession and the ETMC EMS organization is obvious to all who are blessed to make his acquaintance. Michael traveled a long way from New Jersey to Texas and we are pleased he decided to make the journey. Most of us will face a time in which we need emergency medical assistance. When your time comes and you look up to see Michael Griffith’s face and hear his calm, reassuring voice, you can rest easy as you are in highly capable hands!